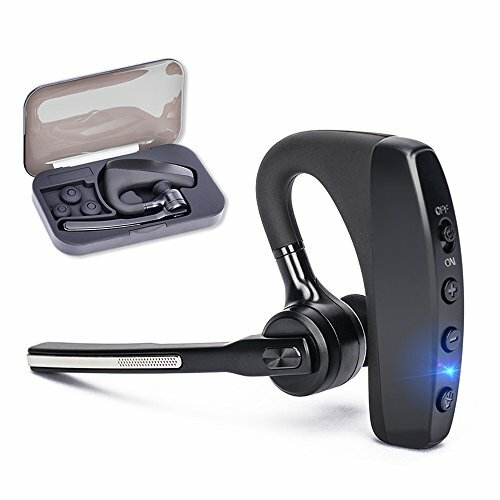 Are you looking for a high-pitched business headset? SHINETAO will be your favorite. ♦ Please do not twist the flip-boom arm so as to avoid damage the headset for normal use. ♦ 3 earbuds tips ensure you can choose more comfortable one and relieve your worry about missing tips. ♦ Please use headset near your mobile phone to assure best effect. ♦ For safety reasons, it is recommended not to use the headset when charging. We provide 90 days no-questions-asked return policy. Any query with our headset, we are always available. Your easy and comfortable life starts with our bluetooth headset. If you are interested in the item, please do not hesitate. Click 'Add to Cart' in the upper right corner of the screen to purchase now at this limited time sale price! 【HIGH FIDELITY SOUND】Built in noise reduction technology, our bluetooth V4.2 earpiece ensures maximum and stable signal quality, and guarantees outstanding sound quality, enables you enjoy the music and call freely. 【SUPER LONG BATTERY LIFE】The new and improved lithium polymer battery allows seamless enjoyment of music for up to 9 hours and super long standby for 180hours, with a quick charge of only 2 hours. The straight distance between your phone and headset reaches far 10m without obstacle and our earpiece works in your pocket. 【DUAL MIC NOISE CANCELLATION】Dual-Microphones with CVC 6.0 noise isolation technology cancels disruptive background noise efficiently like traffic or crowds, and makes you can enjoy high quality sound without wind noise even when riding a motorcycle or driving a car. 【2 DEVICES AVAILABLE】Our headset allows two Bluetooth cellphones to connect at the same time. No matter which phone is called, you will never miss. 【UNIVERSAL COMPATIBLE】Adopted advanced Bluetooth V4.2 with CSR technology, our Bluetooth headset with mic provide a stable call environment for you, and fast pairing with all iOS and Android system smartphone and PAD, including iPhone/Samsung /HUAWEI series. If you have any questions about this product by SHINETAO, contact us by completing and submitting the form below. If you are looking for a specif part number, please include it with your message.